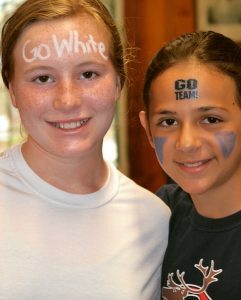 A long standing tradition at Camp Runoia has been having elections to see who will be team captain. The pool is small and anyone who meets the very basic criteria is eligible to run. There are no residency requirements and basically your age and having been in camp a couple of years allows you to be on the ballot. Occasionally girls take themselves off the roster as it is not of interest to them but typically everyone gives it a shot. You get to vote just for the candidate who represents your team in your end of camp and campers are often surprised by the fact that ‘yes’ you can vote for yourself. Candidates get 1-2 minutes to present their ‘reasons why I should be captain’ speech to their team. It is a big deal to stand up in front of a large group and talk about yourself. It is often the first time that girls have had an opportunity to describe their own skill set and successes. For other campers it is a great opportunity to elect someone that they know to a position of leadership and to figure out that your choice makes a difference. Girls use their individual voices in multiple ways during the process and it is an empowering experience. Probably the greatest outcome from camp elections is that as soon as the winners are announced everyone cheers, hugs and offers their support. There may be a few tears from a losing candidate but those quickly turn into offers to help with line ups, song teaching or any other aspect of the captain job that requires support. The voting process is respected and the team is quick to rally behind their new leader regardless of whether or not she got their vote. 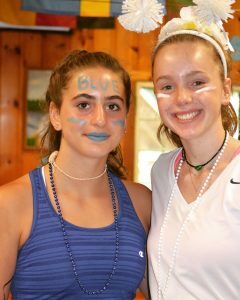 Sometimes the most unlikely candidate wins, the quieter girl who is reliable, consistent and trusted by her camp mates to treat people fairly, the girls who is not necessarily the best athlete but always shows awesome team spirit or the camper that is most respected because she keeps a positive attitude and is fun. It is an honor and privilege for girls to serve their teams and they take their role seriously and put forth their best efforts. They know they walk in the shoes of campers who have been leaders for many years before them and strive for the victory while still remaining great friends with their opponents. 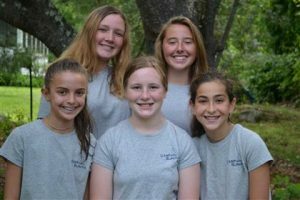 We are glad that camp can provide girls a small taste of the democratic process and encourage campers to stand up to represent their own beliefs and support those that they have the most faith in. It is a relief that election season is finally and why don’t they give out prizes for which candidate has the most creative signs? that’s what we would do at camp! Some of our 2018 elected team captains! Love Nature but Black Flies and Mosquitos?! ?